College students get a bad rep for staying up all night, sleeping excessively and eating noodles in cups too often. But on a budget of $34.31 for a week, we can recognize their pragmatic approach to saving money. Juggling school, work and trying to eat on a small budget is no easy task and we're glad we have a few student Challengers to represent the percentage of CalFresh recipients who are students as well. CalFRESH! Today is the first day of my week of eating on the proposed budget of $34! My family is visiting in town so by the time I woke up, it was too late for breakfast. I finally managed my way to the grocery store to make my purchases. I first made a list of potential dishes that include soup, tacos, chicken and my favorite, Sinigang. Buying the bare necessities for all dishes, I was able to make the cut. My ultimate buy – 12 Cup of Noodles for $2.50! Today was my clinical day at the hospital and brought lunch there for the first time. I packed a Cup of Noodles, half a muffin and pudding. After a few hours of work, I enjoyed my lunch and felt good not spending money at the cafeteria. For the ride home and rest of the day I had some cheddar cheese to keep me company until dinner. For dinner I made Sinigang which will be lasting me for a whopping three days! Making a list of meals for the week has definitely made it easier to stick to the budget. Today I didn’t really have chance to eat much today. I’m actually thankful that my schedule was full, if not I know I would have been hungry. My breakfast consisted of just a banana (29Ȼeach) while I headed to school. I had a chocolate jello pudding, strawberry jam sandwich with 1 slice of bread. For my afternoon snack, I had a banana and another strawberry jam sandwich with 1 slice of bread. For dinner (thankfully its late at night, 9pm) I am having top ramen with an egg. My grocery list for today is 18 eggs ($2.78), 1 loaf of bread with 18 slices ($2.28), and strawberry jam ($2.78). Since Sunday I have spent a total of $9.84, but I still have some extra supplies left. 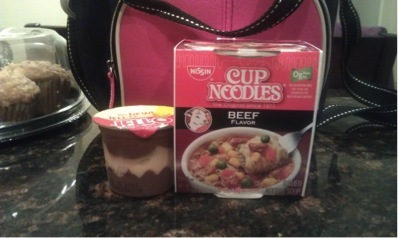 Since I don't have school or work tomorrow, I will try to eat something more extraordinary than cup noodles! But its definitely helps when you're too busy to think about food.